Annan Athletic progressed to the next round of the Petrofac Training Cup after a superb second half performance with Annan ‘s Josh Todd scoring an impressive hat trick to wipe out Sean Crighton’s 10th minute opener for the visitors. Airdrie started very positively and they were rewarded in the 10th minute when Sean Crighton’s header from Sumsky’s corner flew into the top right hand corner of the net. It was just the start the visitors were looking for against an Annan team who were struggling to put two passes together. Annan’s first real effort in the 31st minute was a shot from Todd into the keepers arms after he connected with Weatherson’s flick on. Aidrie missed a golden opportunity to double their advantage in the 32nd minute when Liam Watt blasted over the bar after David Cox picked Watt out with a superb cross from the right. It proved to be a costly miss. 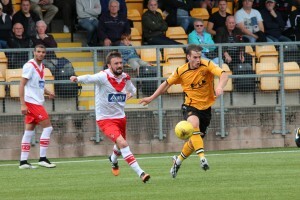 Almost immediately Cox headed over the bar as Annan were being put to the sword. The visitors continued to take the game to Annan , Jordan Hart saved a right footed shot from Cox and Morgan had a 40th minute goal chalked offside, as the game edged towards half time Taylor Morgan’s shot flew over the bar. If the first half belonged to Airdrie the second half was a complete reversal with Annan committed to all out attack but not before Cox rifled past the post after Black misjudged a long ball down the middle. Cox then set up Morgan who was denied by a Hart save. Annan started their come back in the 51st minute and it was a fine goal created in the middle of the park when Sloan drove forward and picked out Todd who’s accurate low shot from the edge of the box found its way past the outstretched arm of keeper Neil Parry. It was just the tonic Annan needed and all of a sudden the game entered a new phase with Annan on the offensive, Weatherson came close when his effort hit the side netting and in the 64th minute Todd had his shot cleared off the goal line. Parry in the Airdrie goal then pulled off a superb fingertip save to deny McColm. All of a sudden play switched to the other end with Hart denying Cox. Parry pulled off another stunning point blank save to deny Rabin Omar who connected with McColm’s telling cross. It was one way traffic as Steven Black tried his luck with a low shot which Parry easily dealt with. It only seemed a matter of time before Annan would be rewarded for attacking play and it came as no surprise when Todd put Annan ahead in the 72nd minute when he connected with Flynn’s flick on from Watson’s throw in from the right. 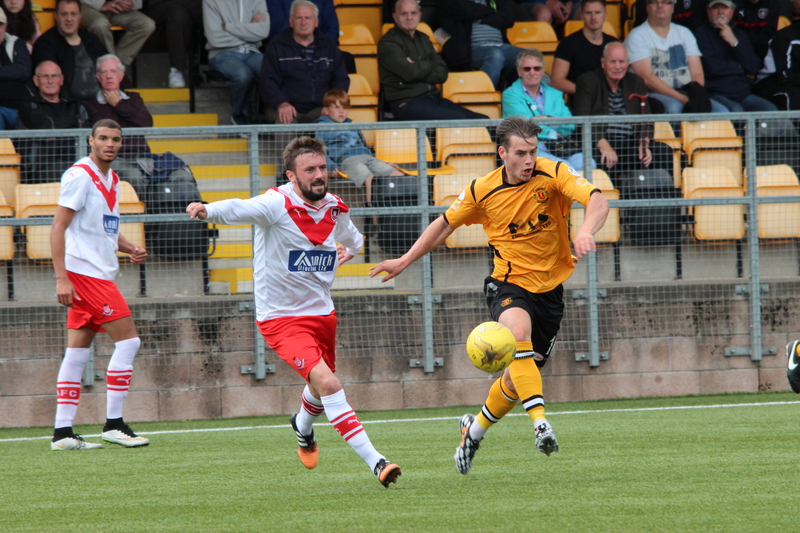 Todd then completed a great afternoons work securing his hat trick when he prodded home Annan’s third two minutes later. Sloan done the damage picking the ball up in the middle and finishing with a precise pass into the path of the alert Todd who had drifted beyond his marker and he slipped the ball past the advancing Hart. Osalador was introduced to the Annan fans in the 80th minute and almost immediately he combined with Flynn who shot narrowly past the post. It was another good result from Annan in this Petrofac Challenge Cup competition against higher league opposition and there is no reason to believe that this squad are capable of emulating their previous encounters when they have proceeded to the semi final stages before being beaten by Raith Rovers, Falkirk and Dundee respectively . Annan Athletic – J Hart, S Black, S Swinglehurst, M McNiff, P Watson, S Sloan, R Omar, M Flynn ,P Weatherson, J Todd, S McColm ( S Osalador 80 min). Substitutes unused C Liddell, D Wadge, J Watson, S Norman, B Wagner, B Currie. Airdrieonians – N Parry, J Bain, D Zanten, K McBride, S Crighton, A Lithgow, L Watt (C McAleer 79 min, S Stewart, T Morgan, N Sumsky (J Morton 67 min), D Cox. Referee D Munro Assistants S Hodge, G Plu.